London designers Russell and Oona Pinch have designed a collection of furniture including these folding wooden stools (above). Above: JOYCE.The Joyce cabinet is inspired by Victorian optometrist’s shopfitting. It has sliding glass fronted doors and a cherry-lined interior with shelves and drawers making it suitable for a variety of uses throughout the house. Available in solid timber and painted finishes with interior options of shelves and/or drawers. and combinations thereof. Other pieces in the range include a cabinet, sofa and coffee table. Above: CLEMENT. The Clement coffee table has an elliptical top, elegantly softened edges, curved legs and merges a combination of materials with its oak top, solid walnut legs and painted shelf. Above: LOWRY. The Lowry sideboard features a series of solid wood fins, of varying widths and depths, creating a sculptural front section. The fin sections also act as handles for the cupboards at each end and the two central drawers. Complimenting the existing range, the offering includes several high quality cabinetry pieces for which PINCH have become synonymous, a folding and wall mountable stool and two new finely tailored upholstery pieces. Above: IMO. 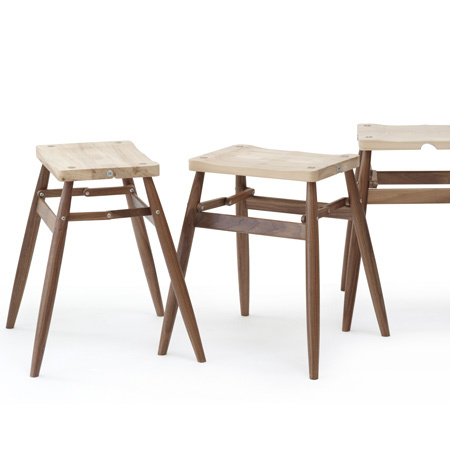 This graceful stool is made with a solid walnut frame and a solid elm top. Imo folds down through its centre, allowing it to be wall mounted using an accompanying walnut peg, so it may look as elegant when stored as it does in use. Above: FREY SIDEBOARD. The simplicity of the perfectly proportioned Frey panelling works well in sideboard form. Each double panelled section opens to reveal walnut-lined locking cupboards with an adjustable shelf. The PINCH approach to design combines a keen appreciation of artistic lines and form, absolute attention to detail, sensitivity to materials and commitment to using the best production standards possible, employing traditional UK makers. Above: BOYD. This deep and generous sofa is designed as an ultimate curl up sofa. It has deep feather filled cushions and a tall sprung back which effortlessly supports your head and back, combining formal tailoring with a relaxed and sumptuous seat. These combined qualities lend their creations integrity and artistic elegance in equal measure. Above: LYLE. Made from solid walnut with a drawer to its centre and a honed limestone top, this finely proportioned console has many possible positions in the home, from hallway table to freestanding room-divider. Above: YVES DESK. Now issued in a stunning new aubergine colourway. The award winning Yves desk is a modern interpretation of a traditional writing desk. Its straight lines are softened with curvaceous details on the legs, top and side panels. The elegant walnut is contrasted with the inlaid leather writing surface. It has two drawers and cable access in the top surface. Above: MOREAU. The usually conventional camel back characteristic has been reinterpreted in the Moreau sofa. The gently raised curve creates a stately silhouette whilst the traditional stiffness is softened by the continous curves delivering an informal and comfortable recline. Above: PENDEL FOOTSTOOL. The Pendel armchair’s comfort is now maximized with an accompanying footstool which continues the design’s same gentle curved lines.